This two page document outlines all subject area standards for third quarter. 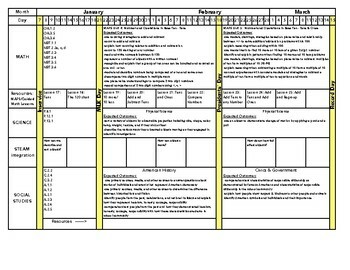 It is a great reference for unit planning. It can be used across school districts, however, it is perfectly aligned to the Manatee County Florida roadmaps. This pacing guide lists the student expected outcomes for all ELA standards (Reading, Writing, Foundational, and Language). It also includes all Math expected outcomes. 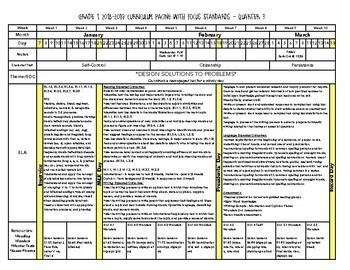 If you are using the Ready MAFS materials the lessons are outlined for you as well. Science and Social Studies standards are provided along with STEAM integration and an Engineering Design Challenge. I also have an editable version, but you MUST have the Mac program - Pages - in order to open and edit. Email me and I can send you that version as well. The preview shows the Kindergarten guide for Quarter 1 (the format is the same across all grades). Note: Quarters 1-2 are also available for purchase!